BrettCajun comes in to visit DC tomorrow. TJ and I are hosting him, and are desperately looking for tennis venues or places with chickens to keep him happy. A visit to Blowoff is in order on Saturday at the very least. The photo at left is a knitted (or crocheted?) version of an alien from the new Dr. Who called an Adiposian. Adiposians breed by emerging from the fat of other species, such as Earthlings. Apparently the knitter is in a knot with the show due to possible trademark and copyright infringements. 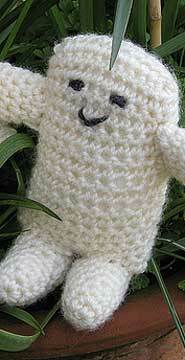 Alien knitting patterns undo Dr Who fan. Mad knitters are also crocheting their own version of the Great Barrier Reef to bring attention to global warming. This Saturday at 1pm we’re up against our friends from Pax River at at Colmar Manor Park for the last home match of the season until we go to Dublin in June for the big gay rugby tournament. If there’s time I hope to get over to the Long View Gallery for Scott Brooks’ Mid City Artists Open Studio Tour. Posted by jimbo on May 15, 2008 at 2:24 pm under gay, geek, outdoors, sports, The DC.